*Inclusive of a voluntary 10% donation to help fund our wildlife conservation work around the world. Advance online ticket prices excluding a voluntary 10% donation are: Adult £24.54; Child £15.95; Concession £22.09. Gate and online price within two days of visit excluding a voluntary 10% donation are: Adult £27.27; Child £17.73; Concession £24.54. 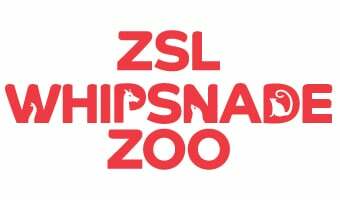 * Book online at zsl.org up to 23:59 two days before your visit to receive 10% off standard gate ticket prices (i.e. Before 23:59 on Thursday to visit Saturday). Tickets bought within two days of your visit will be charged the walk-up gate price. Please note, many external promotions are only redeemable at the gate and cannot be used in conjunction with tickets purchased online. Advance online ticket prices excluding a voluntary 10% donation are: Adult £22.91; Child £14.89; Concession £20.62. Gate and online price within two days of visit excluding a voluntary 10% donation are: Adult £25.45; Child £16.54; Concession £22.91. Ticket prices from 1 June will vary by date. Please click on 'Buy Tickets' and select your chosen date from the calendar to see the ticket prices for that date. Become a ZSL Member today for unlimited visits to ZSL London and Whipsnade Zoos, from just £66! Rollerskates, rollerblades, skateboards are not allowed on zoo premises. Children's scooters are permitted under the supervision of an adult. Discounted rate for student, seniors and disabled visitors. Relevant supporting documents must be brought on the day of your visit. One free adult ticket with every 10 paying children. Free entry for one essential carer or free car entry into the Zoo is available per paying disabled visitor. Trikes for children (18 months+ up to a maximum of 20kg) are available to hire for just £5 from the retail tills at our Visitor Centre. We recommend that children using trikes wear a helmet (we have a limited supply available, please ask). A refundable deposit of £20 is required. Enjoy unlimited visits to ZSL London and Whipsnade Zoos, plus a host of other benefits.